Super glue can stick almost anything together. Model-makers use it to assemble their miniatures, and DIY enthusiasts can rely on it as a quick-fix. But the discovery of cyanoacrylate — the chemical family of super glue — was a breakthrough for industrial adhesives that owes a lot to military research. 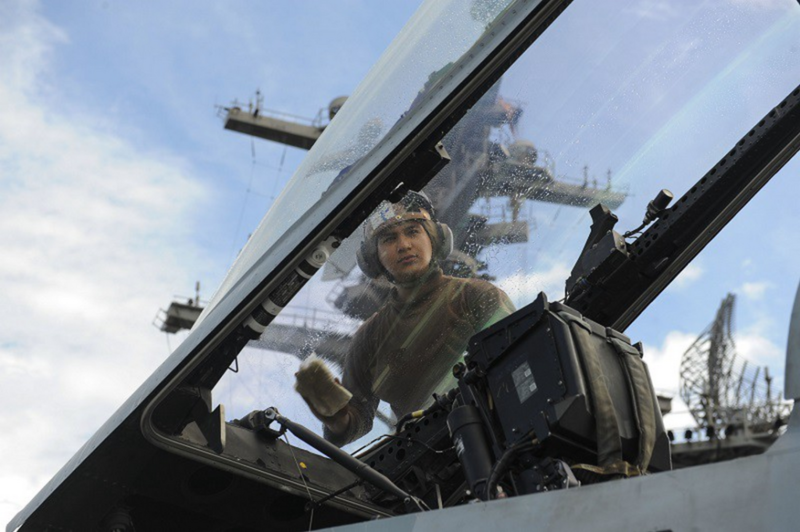 Military and government necessity drives unexpected innovation, and that’s just as true for cyanoacrylate. The chemical moved from experimental plastic to industrial adhesive … and became a first-aid treatment for wounded troops. And its story begins just before World War II. The father of super glue, Harry Wesley Coover, worked at the Eastman Kodak Company in Rochester, New York. The well-known photographic film company had a long history of military research. After the American entry into World War I, Kodak provided the U.S. Army’s Signal Corps with cameras and training. The company supplied cellulose acetate to the U.S. Navy for “aircraft dope” — a lacquer to tighten and weatherproof airplanes. The company’s celluloid also made its way into gas masks as unbreakable eyepieces. When America again went to war in 1941, Kodak joined the effort. The company tasked its optical engineers with researching precision bomb sights and night-vision devices. Meanwhile, Kodack’s scientists cooked up new plastics and chemicals for the military. Among them was Coover, a graduate student working at Kodak while he completed his degree at Cornell University. In 1942, Coover’s team searched for the perfect transparent plastic to cast gun sights. The scientists experimented with several different compounds in their search for a polymer with an optical clarity that could rival glass. Condensing formaldehyde and cyanoacetate, Coover created cyanoacrylate monomers. These monomers quickly bonded with themselves in the presence of moisture, creating long polymer chains that hardened into a clear plastic. The gun sight was a complete failure — far too sticky to be useful— but Coover took notes and filed the quick-bonding adhesive away. Nine years passed, and Coover had no idea at the time that he was sitting on a goldmine. The cyanoacrylate had bonded the two expensive glass prisms together and neither Joyner nor his superiors could figure out how to separate them. Coover then realized the importance of his discovery nine years prior. “I didn’t recognize, at first, that this was not a casting material we were working with but a unique new adhesive,” he told theChicago Tribunein 1986. With most surfaces containing some amount of moisture, cyanoacrylate was a perfect all-purpose adhesive. Like any inventor in the Atomic Age, Coover plugged his discovery to America’s growing T.V. audience. He appeared on I’ve Got a Secret in 1959 where a drop of super glue bonded two steel cylinders together so strongly that they suspended both the show’s host, Garry Moore, and Coover off the stage. This stunt was a public marvel, but Tennessee Eastman wouldn’t release a general consumer product until 1973. Eastman 910 — as the adhesive was branded — was “very expensive and is only available for industrial users,” Coover told Moore at the end of the segment. But even in the marketplace, super glue couldn’t escape its ties to military applications. Its first sale was to engineering firm Mason & Hanger. From 1956 to 2001, Mason & Hanger operated America’s atomic weapons assembly facility — the Pantex Plant near Amarillo, Texas. According to Coover, Mason & Hanger used super glue in the assembly of these atomic weapons. But it wasn’t gun sights, jet canopies or atomic weapons where cyanoacrylate showed the most military promise. Instead Coover saw a possible breakthrough for medicine — particularly combat trauma. Anyone who has used super glue or its competitors knows how easy it is to bond your fingers together. Coover saw that the same problem that annoyed cyanoacrylate’s industrial customers could revolutionize medical wound management. He tapped into the medical dream of sutureless medical procedures — no more stitches and staples, just super glue. In 1960, Tennessee Eastman teamed up with Ethicon — a subsidiary of Johnson & Johnson. For more than a decade the firms conducted animal and human studies into how the chemical could be used on the battlefield. With cyanoacrylates, surgeons could join veins, arteries and intestines together or seal a cut through the skin. Ophthalmologists could apply the adhesive to seal cuts to the eyeball, improving on very difficult conventional methods. As the research continued, the medical benefits of cyanoacrylate seemed endless. The adhesive used in these trials was not the same as the stuff glueing together America’s atomic weapons. Eastman and Ethicon’s research had already found that the cyanoacrylates in the industrial adhesives were toxic to animal tissues causing inflammation, irritation and increasing formaldehyde levels in the body. For medical purposes, the researchers used longer-chained cyanoacrylates which showed little to no toxicity in clinical trials. The longer chains of polymers solidified more quickly than the industrial adhesive resulting in the unforeseen medical application for super glue as a hemostatic agent. Nowhere is this more true than in combat trauma medicine. The U.S. Army Medical Biomechanical Research Laboratory showed great interest in Eastman’s research into tissue adhesives. During the 1960s, increasing number of American soldiers were fighting in the jungles and streets of Vietnam. The war injured or killed eight percent of the soldiers deployed, many to highly traumatic injuries such as gunshot or shrapnel wounds. 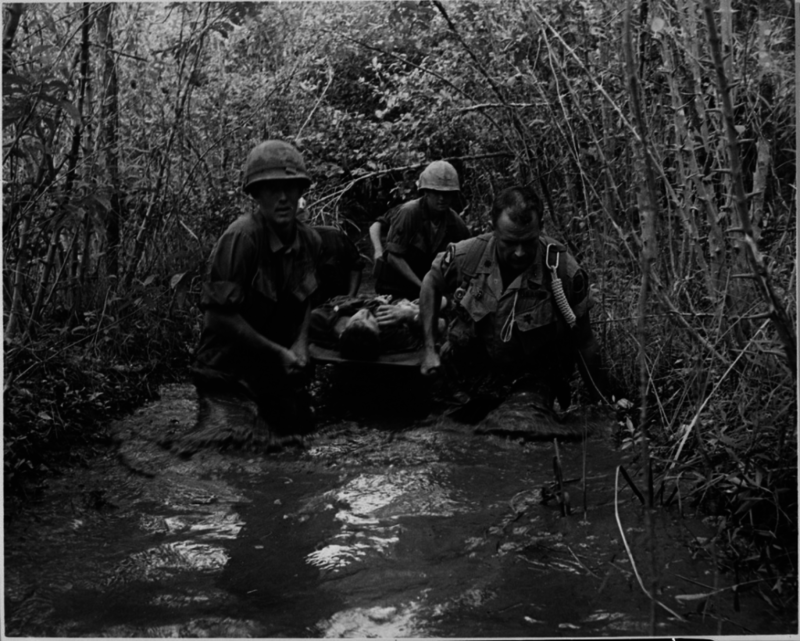 Helicopter evacuation allowed many of these wounded soldiers to receive medical attention within minutes of their injuries. But many succumbed to uncontrolled bleeding in the chest or abdomen before they could be properly treated. The Biochemical Research Laboratory funded research into cyanoacrylates and developed its own sterile disposable spray-on product. Many competing products needed to be hooked up to nitrogen canisters and required extensive cleaning, which made them unusable in the field. The Army’s spray was more soldier-proof, and inspired such confidence that in 1966 the U.S. Army sent a special surgical team to Vietnam equipped and trained in the use of the sprays. Field medics also used the spray to stop bleeding during casualty evacuation. Cyanoacrylate was a last-ditch tool to prevent wounded soldiers from dying, and was not extensively used by the Army team — but when used it was mostly successful. Chantelle Champagne at the University of Alberta reviewed medical literature on the use of cyanoacrylates. Cyanoacrylate sprays successfully stopped bleeding in all but four of 30 well-documented Vietnam War cases. Beyond these cases were many more instances of cyanoacrylate use in the field which lacked the documentation required by these medical studies. Back on the homefront, however, the U.S. Food and Drug Administration was skeptical of the chemical’s safety. Eastman submitted an application for new drug approval in 1964, not knowing that they were entering a 30-year battle to put their product in the hands of American surgeons. “FDA scientists put massive implants of super glue in rats, which caused tumors — some of them malignant. Almost anything that massive would cause a tumor,” Coover told the Chicago Tribune. The inventor felt that the FDA’s tests did not represent the kind of use his team were promoting — small topical amounts of cyanoacrylate as a tissue adhesive which degraded in the body in about 14 days. As American bureaucracy exercised extreme caution, Japan, Austria, Germany and Canada, among others, conducted their own clinical trials in the 1960s and 1970s. Japan approved cyanoacrylate tissue adhesives in 1963, Germany followed in 1968. The FDA didn’t cave in to overwhelming research findings and international experience until 1998, when it finally reclassified cyanoacrylate for topical use. Cyanoacrylate continues to be part of military and civilian trauma kits worldwide as a tissue adhesive. The hemostatic properties that proved so useful in Vietnam, however, have recently been overshadowed by fast-acting, biologically-neutral solutions using chitosan (Celox, Hemcon) or kaolin (QuikClot). But give credit where it’s due to super glue. Cooper’s discovery and its multi-purpose nature shows how the military can generate innovation in the private sector. Without Kodak’s involvement in America’s wartime economy, the world might have been left with a lot fewer aircraft models and repaired vases — not to mention fewer soldiers returning home from Vietnam. This story originally appeared inWar Is Boringon Nov. 27, 2015.